Due to ongoing technical difficulties, only the Anthem and most of the sermon are available for this week’s service. We apologize for the problem and are working to resolve it quickly. Due to technical difficulties, recordings from this service are not available. We apologize for the problem and are working to resolve it quickly. 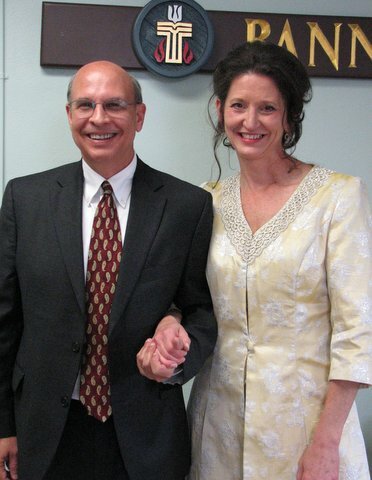 September 28, 2014 – “Sixteenth Sunday after Pentecost” and Wedding of Rev. Feild Russell and Laura Carringer. Sunday’s worship service is a Hymn Festival, as we use music to lead us in our glory of God. Themes of blessing, and our response to that blessing, are present as we move from recognition of God’s greatness, to our incompleteness and need for forgiveness, to some of the ways God reaches out to us to sustain and even recreate us. 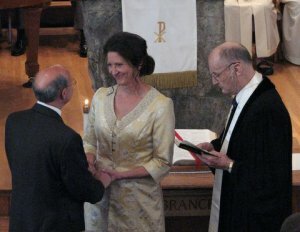 At the end of worship, in response to their own understanding of God’s activity and blessing in their lives, Laura Carringer and Feild Russell exchange marriage vows. The father of the bride, Ernie Banner, retired U.S. Army chaplain, officiates this part of the service. Click Below to listen to the recording of this very special service. A video of the exchange of vows can be viewed by clicking on the image below. NOTE: The audio is very weak, so turn up the volume!!! The Memorial Service for Dr. John Wilson was held at Banner Elk Presbyterian Church on Saturday, September 13, 2014. Anthem – How Can I Keep from Singing? Click below to view the video of the exciting wedding announcement!